I need to be honest. I’m not really looking forward to this portion of my Simplify series. I actually intended on waiting until later in the year to this, so I could just keep on eating the crap I’m addicted to. But, part of my team is doing a cleanse right now, which really just includes clean eating and a few doTERRA supplements. I know these things are usually easier when done in a community, so I wanted to jump on this opportunity. Now, I’m not doing the “cleanse” part. Even though doTERRA provides a very gentle and safe cleanse, it’s not recommended while pregnant or nursing. Your body already has a high demand during pregnancy and breastfeeding, so there is no need to cause any additional stress. Although, I do have to say, I take doTERRA’s Lifelong Vitality pack as my pre and postnatal multivitamin and I’ve had amazing results. So, what does this month look like for me? Basically, I’m going to simplify my food choices. If I can’t pronounce it, I won’t eat it. If it came from a cow, I won’t eat it. If it’s made in a lab (think: refined flours and sugar/sweeteners), I won’t eat it. BUT what I will do is eat more vegetables and fruits. I will eat more Godmade food, and take out the manmade foods. I will explore different grains other than flour. I will try new recipes, and create new habits. I actually started this on January 29th so I could make it a solid 30 days, instead of a random 28. Why does February only have 28 days? I just liked the way 30 sounded better than 28. I know, I’m weird. All that to say, it’s been 10 days of clean eating. 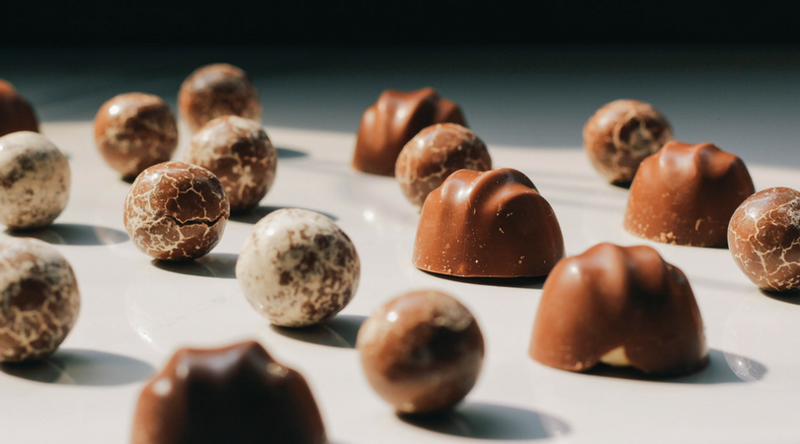 Giving up sugar was the most difficult during the first 3 days. After that, my mind just switched to FEED ME ALL THE BREAD. I’ve realized much of what I eat on a daily basis is just habit. Normally when I make the kids’ sandwiches, I’ll eat a bite of it. When I put pretzels in a snack bag for them, I’ll take a couple for myself. (I may have spit one out the other day when I realized what I was doing!) I eat pasta at least once a week because it’s convenient and I have a homemade tomato sauce we all love. I got used to eating a flour tortilla while cooking tacos. I made a habit of always eating a bowl of cereal at night because I felt like I deserved it at the end of the day. So much refined flour. Hello, my name is Amanda, and I am a bread junkie. I’ve made some changes now that are becoming my habit. I’ve stopped packing as much grains for my kids’ lunches. Now it’s not a sandwich and pretzels, it’s a sandwich and an apple or orange. I make zoodles for myself instead of traditional pasta noodles. 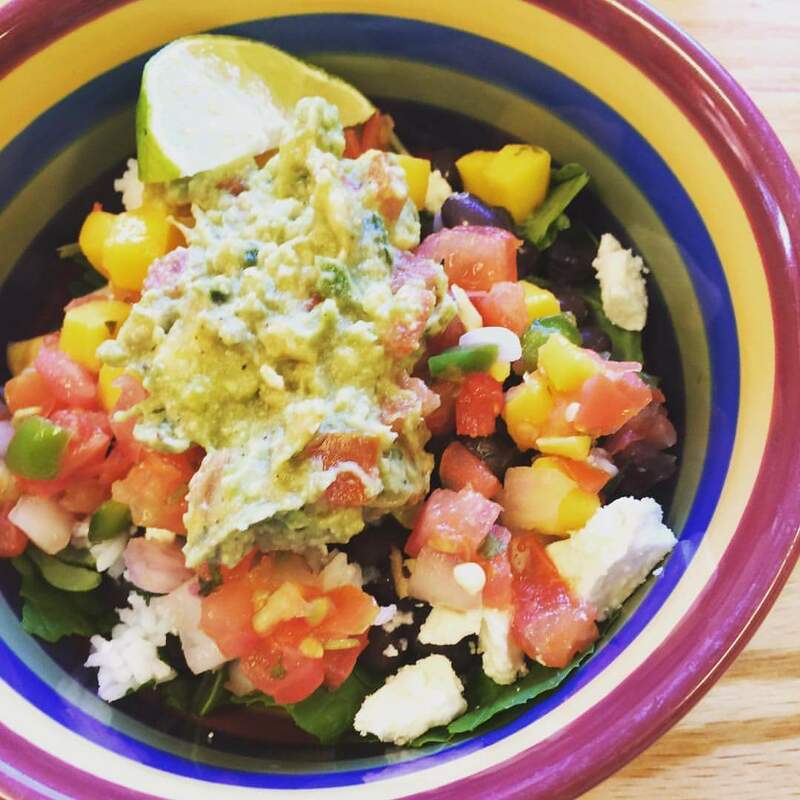 Instead of eating flour tortillas, I eat the clean taco toppings (ground turkey or black beans, pico de gallo, and guac… so good!) on a bed of greens. They’re small changes, but that’s how change happens. I’m creating new habits. It’s not perfect, but it’s progress. Cutting out dairy has not really been a challenge, although I totally spaced during the Super Bowl and put cheese on my chili. I also forgot last week and tried a sample of Fro Yo, then thought Why does this taste like heaven? Then I remembered I hadn’t had sugar or dairy in days. Don’t worry though, I didn’t eat a cup! I threw away the unfinished sample, and tried to ignore my mind screaming at me to eat the freakin fro yo while everyone around me enjoyed it. I’m pretty excited to see what’s to come. I’m already noticing small changes for the better. I’m not craving sugar nearly as often. Usually I don’t want it unless I see it. My mind is still obsessed with bread, but I’m hopeful that this will change as well. I’m excited to try different grains and create new habits. Stay tuned for another update soon! Have you gone gluten free? Sugar free? Dairy free? Share some success tips with us! 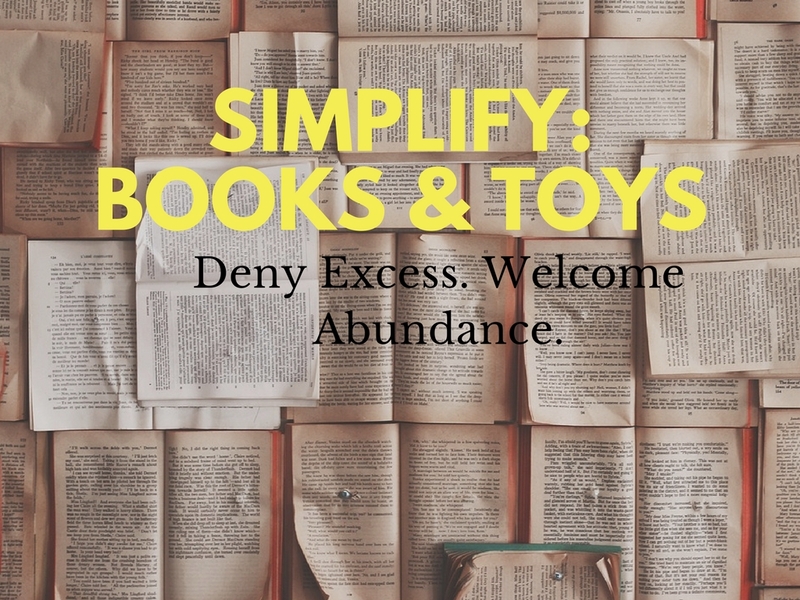 As a mom of 4 kids, we have a plethora of books and toys. I decided that would be the next place to start purging. I began with my own book collection. I didn’t attach a number to them, and I probably never will, but I did tell myself this: If I never went back and picked up the book again, don’t keep it. I had 10 books left by the time I was done. And y’all, I’m a reader. I’ve always loved to read. So, previously, I would hang on to books I thought were okay or books by famous authors that I thought maybe I’d appreciate later. Not anymore! I had also been hanging on to books from my psychology program that I’d never gone back to read. I only kept 1 of my psychology books, and again it was one I enjoyed reading. I said goodbye to Freud, Skinner, and behavioral therapy, and I kept Jung. I filled up an entire plastic tub of books. It was pretty liberating. As far as my kids’ books, I decided to leave room for 2 bookshelves of books. On the top shelf we have books for the “older” boys, and on the bottom we have board books. It still looks like quite a bit, but I know in a couple of years those board books will be gone. I currently have a large box filled with kids books. I’m wondering what the best option would be now. Should I sell them? Or donate them? I’d like to donate them, but I haven’t done much research on that. If anyone has any insights on this, please comment below and share your knowledge! My boys had so many toys they forgot about half of the toys they did have in their room. My goal was just to keep enough toys where I could see them all. I got all their toys out of boxes, put their favorite ones on the shelf, and got rid of what couldn’t fit. Also, I did put some of the noise making toys in the garage sale, because there’s only so much this mom can take. Bulky items like Halloween costumes that they still play with, we put in clear plastic bins on the floor in their closets. Then they can see them and easily get to them when they decide they want to turn into a dragon, giraffe or Paw Patrol character. If I’m being honest, my boys still have what seems to be an insane amount of toys. Against their bedroom walls are bins of Legos, Mega Blocks, wooden blocks, alphabet blocks, and squishy cloth blocks. I really don’t think they need that many blocks. I could probably do another sweep in their room and come out with more stuff, but for now I’m done. Mainly because this purge has taken up a lot of my time these past couple of weeks! We did have a garage sale, which is an adventure in and of itself, but I’ll post more on that later! In the meantime, live simply and contently my friends! I must know: What tips can you share with parents on how to decide what toys to keep or what toys to toss? 2. We have a LOT of stuff. Clothes, books I haven’t read in years, kitchen gadgets, toys that were lost and forgotten about, just a bunch of stuff. This first month of the year I am tackling just that: stuff. I know it’s a broad category… But we’re having a garage sale soon, so I might as well document this as I go, right? The first week of January I worked on going through our wardrobes. I first wanted to tackle the kids’ clothes. They seemed to have so. much. clothes. I had this philosophy: If I don’t love it, get rid of it. So that’s what I did. Y’all, they had boxes of clothes that were too small for them, too big for my oldest, and everything in between. I kept enough in their dresser to get them through a week without having to do laundry, and then headed to a second hand kids’ clothing store in town. This was so liberating. It was almost like the kids had so much clothes that I didn’t really know what clothes they did have in their closets! And honestly, my boys pick out the same 4 T-shirts to wear on a regular basis anyway, so they aren’t missing a thing. Next on my list: my closet. I have gotten so used to hanging on to maternity clothes, nursing tanks, jeans that are a size bigger than my normal size for that awkward post-baby time period when nothing fits right… I got rid of it all. The same philosophy went through my mind: If you don’t love it, get rid of it. Why would I want to hang on to a top that I don’t feel confident wearing? It makes no sense cluttering up my closet thinking one day I’ll wear it when I haven’t worn it in 2 years! Now, my magic number is 5. I decided to keep 5 of everything: 5 short sleeved tops, 5 long sleeved tops, 5 tanks, 5 dresses, and 5 pairs of shoes. As far as jeans go, I currently only have 2 pairs that fit me and 1 pair of shorts so that kinda worked out on its own. Again, it felt great. I know I’m going to love whatever I put on, because I didn’t bother to let anything else clutter my side of the closet. Even now, when I look back on my newly simplified closet, I still feel like I can empty it a little more, but I’m comfortable with where it’s at for now. 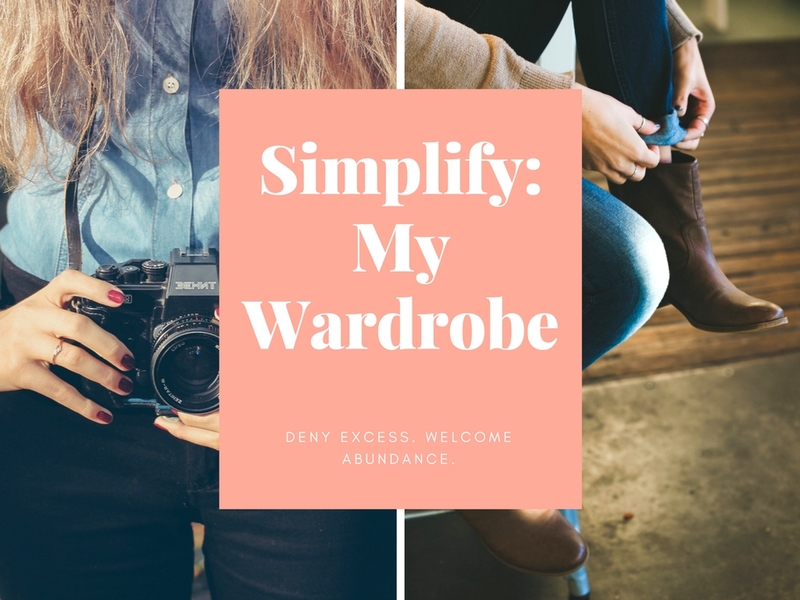 I’d love to hear about some of your journeys to simplify your closets! Share some of your tips on how to you keep your closets free of excess and and full of abundance!